EHRs. I admit it. 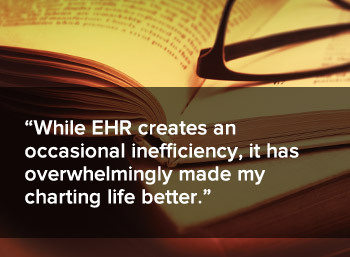 It took me about 2 years before I succumbed to using an EHR. There was no good reason for the avoidance. I was already used to using my computer to type my notes - a laborious process that took way too many hours. My notes were saved onto my personal computer, which, while password protected, did not feel altogether compliant with HIPAA. Still, I resisted. I was just intimidated by the learning curve and frankly, was worried about the time it would take to learn and integrate something new. Then, one day, after a long night of charting, fed up with myself, I took out my credit card and signed up for an EHR. Now that I had paid, I was more motivated to learn. I chose DrChrono as, at the time, it was the only EHR that had a fully functional iPad platform. While they offered a free platform (most systems do), I elected to go for the paid version since it had more conveniences and, importantly, free customer support to help me get started. That was the magic ticket for me. After a few half hour web calls, I was ready to go. They even created a new template chart note from my requirements and imported my entire list of patients so my office staff could more easily start new electronic charts. I have been using an EHR for a year now. I will never go back. While it creates an occasional inefficiency, it has overwhelmingly made my charting life better. I still spend a lot of time charting, but now that time is being spent on more substantive aspects - researching treatments, reviewing past assessments and treatments, etc. And, I have to admit, as much of a stickler as I was before, my charting is much better now. The template encourages me to be more thorough and organized. I can honestly say that using an EHR has made me a better doctor. Dive in. If you have investigated EHR options and are drawn towards one, go for it. Pay for a subscription. The paid versions typically offer more support and options (plus the paid versions are usually faster). Look for tablet friendly options. If you use tablets within your practice, then I highly recommend systems that incorporate the iPad. I typically chart into my tablet which frees up my computer to look things up, review records etc. Customize your notes template. Spend the time to work with customer support to customize your notes template. The more comfortable it is for you, the happier you will be while charting (that's important!) and the better your charts will be. Finally, expand on your electronic options. Don't be afraid to expand your electronic practice to other systems. I have long used a virtual dispensary to provide product recommendations to my patients - something which has recently become even easier through a very patient-centric platform called HealthWave. Ok, one more thing, most EHRs include the ability to e-fax your notes to your patient's other providers. This is one of the most important things that we, as integrative practitioners, can do. Share your notes (with the patient's permission, of course) with other providers to create collegial and respectful relationships, and ultimately truly integrated care. Dr. Lise Alschuler is a naturopathic doctor with board certification in naturopathic oncology. She graduated from Brown University with an undergraduate degree in medical anthropology and received a doctoral degree in naturopathic medicine from Bastyr University in 1994. Dr. Alschuler is board certified in naturopathic oncology and has been a practicing naturopathic physician since 1994. * Your address may be undeliverable. †† For homeopathic products: these indications are based solely on traditional homeopathic use. They have not been evaluated by the Food & Drug Administration. * For dietary supplements: this statement has not been evaluated by the Food & Drug Administration. This product is not intended to diagnose, treat, cure or prevent any disease.